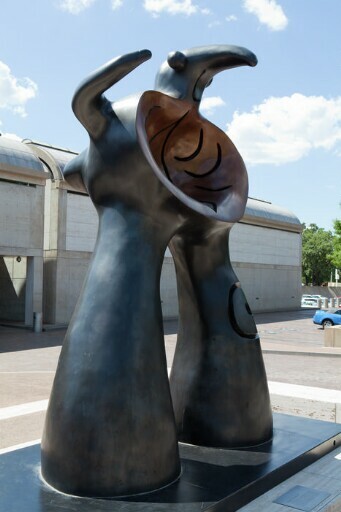 With its peculiar proportions and anatomy, Miró’s huge fantasy monument Woman Addressing the Public is indebted to the artist’s lifelong study of the imaginative and expressive powers of the art of children. He first realized its design in 1971 as a twenty-inch plaster maquette painted white, with color accents for the eyes, arms, and sexual organs. He then made a collage with a photograph of the maquette pasted onto a photograph of the entrance to the Los Angeles County Museum of Art, intending the work as a monument of welcome and maternity. Unable to realize the project in Los Angeles, Miró submitted it as a proposal for Central Park, dedicated to the children of New York City, which did not materialize. In 1978, the Hirshhorn Museum and Sculpture Garden, in Washington, expressed interest in commissioning the still unrealized Woman Addressing the Public, but the project was once again abandoned. It would be nearly a quarter of a century before his playful “monster” would finally have a place of honor outside an important museum, the Kimbell. The final work, cast in an edition of four when the artist was eighty-seven, weighs roughly three tons. The art of children was indeed a major source of inspiration for Miró, and whimsical creatures related in appearance to Woman Addressing the Public began to appear in his paintings and drawings in the 1920s. It was only after World War II, however, that he began to fashion little statuettes of similar figures, perhaps inspired by the surreal sculptures of his fellow countryman Picasso. Miró began to develop his ideas as sculpture at full scale in the 1950s and 1960s, in effect embarking on a second career as a sculptor expressly interested in art for public spaces. The female creature with arms outspread was his favorite sculptural subject, and Woman Addressing the Public is his grandest and ultimate statement of the theme. purchased by Kimbell Art Foundation, Fort Worth, 1996.